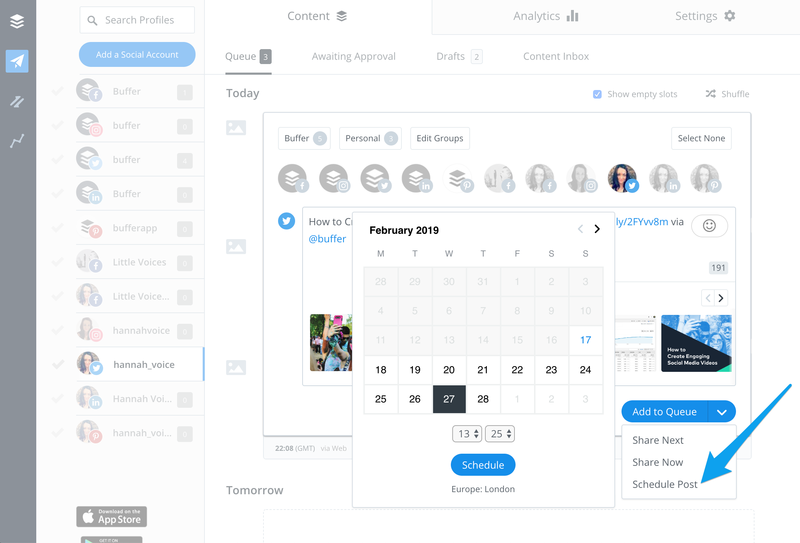 Each of your connected social accounts will have its own Queue, which stores all of your posts that are waiting to be published. Before we dive in, let's quickly cover how time slots appear in your Queue. 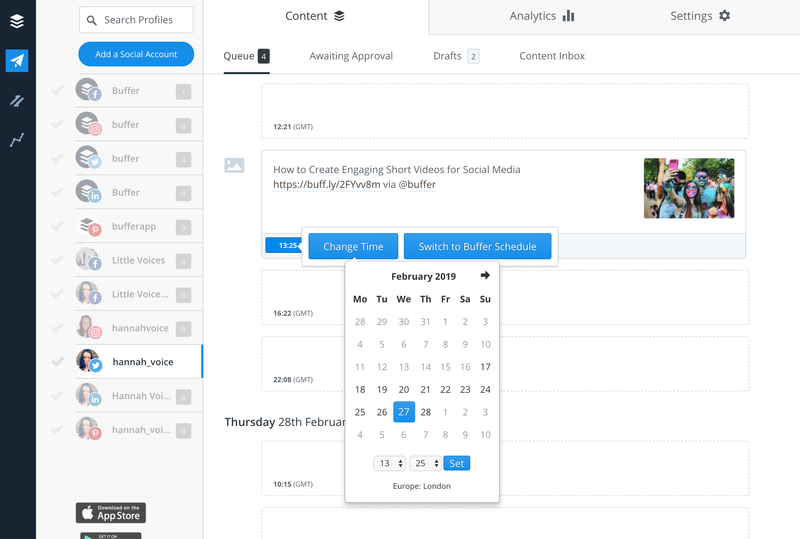 You're able to choose the days and time you'd like to be sharing content by setting up your Posting Schedule. Each time that you add there becomes an empty time slot in your queue. Queue posts: Posts added to your Queue using the Add to Queue or Share Next options are "Queue posts", which will be published according to your Posting Schedule. Pinned posts: Posts added to your Queue using the Schedule Post option are "pinned posts", which will be published at the specific custom date and time you've chosen. Posts scheduled using the Future Queue feature are also "pinned posts". The term "Future Queue" relates to the empty time slots that you see in your Queue, allowing you to plan posts into the future. 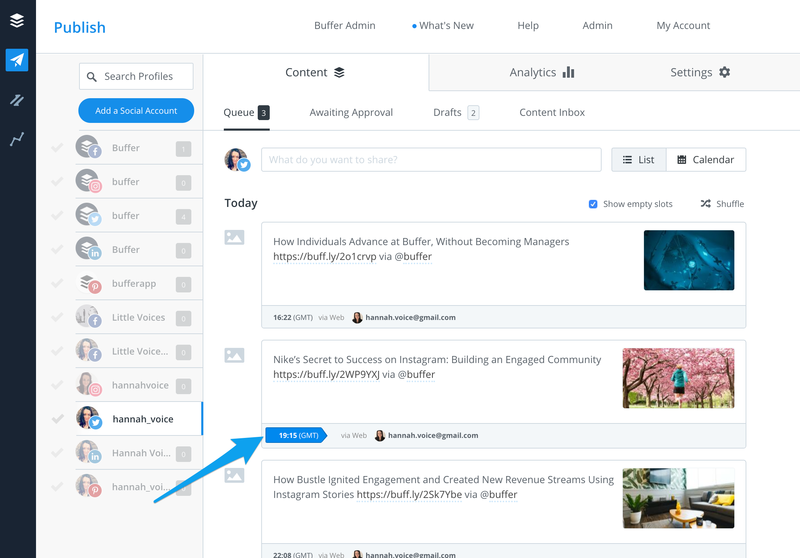 You can spot "pinned posts" easily in your Queue as they'll be highlighted with a blue banner displaying the custom date and time they're due to be published. Posts added to your Queue using the Add to Queue or Share Next options are "Queue posts", which will be published according to your Posting Schedule. While most of your posts will likely only require you to add them to the Queue, there are instances where a little more customization might be required. Do you have a big news or launch that you'd like to announce at exactly 9:15am on Friday? Or maybe you've prepared a post that would fit perfectly in next Tuesday's 10:56am slot from your Posting Schedule. We have two features, which might be just what you need - the Schedule Post option and the Future Queue. These two features are quite similar in that they allow you to pick a specific time for your post to be published. The key difference is that using the Schedule Post option, you’re picking a completely custom date and time outside of your usual posting schedule, while using the Future Queue option, you’re picking from one of your available time slots from within your Posting Schedule. Custom scheduling posts can be a great asset to your social media planning and allow you to set up posts far in advance, so you can be prepared to share all the wonderful events you think your followers would enjoy during the year. It is also a great tool to use when planning time-sensitive events to make sure everything gets shared at the right time! If you'd like to publish a post at a specific custom date and time, we'd recommend using the Schedule Post option. Once you've created your post within the Composer, click on the small drop down arrow to the right of Add to Queue and then click on Schedule Post. Once selected, you’ll notice a small calendar pop up, allowing you to choose the specific date and time that you’d like the post to be shared. Posts created this way will be added to your Queue as "pinned posts", meaning they won't be affected by anything else happening in your Queue. 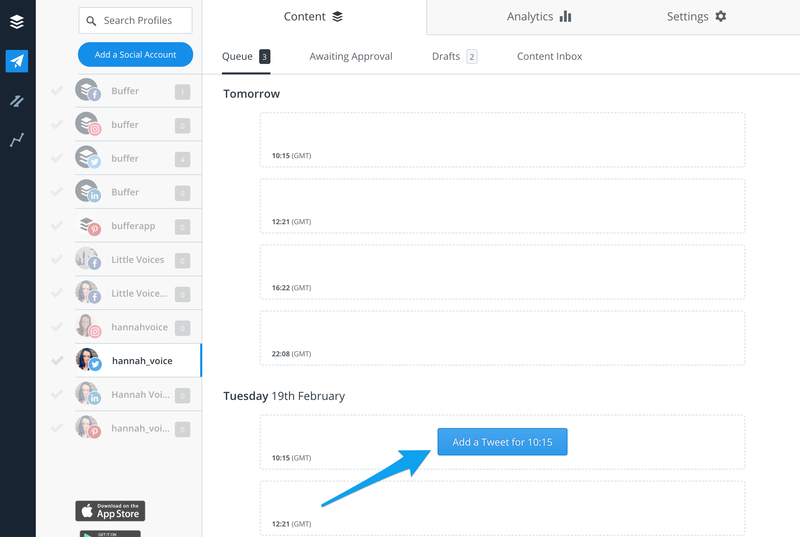 You can spot pinned posts easily in your Queue as they'll be highlighted with a blue banner displaying the custom date and time they're due to be published. You can always change the time of a scheduled post by hovering over the time and clicking Change Time. Alternatively, you can remove the custom date and time by clicking Switch to Buffer Schedule. The post will then behave like a regular queued post and be published according to your Posting Schedule. The Future Queue is only available on our Pro and Business Plans. It is not available on the Free Plan. You can find more information on our plans and pricing here. The term "Future Queue" relates to the empty time slots that you see in your Queue, allowing you to plan posts into the future. If you're not seeing any empty time slots, please check that a) the Show empty slots toggle at the top right of your queue is ticked and b) you have a Posting Schedule set up. Let’s say you have a new feature launch just around the corner and you have a special post to share with your followers on February 19. However, you don’t want to add an extra post to your sharing flow on that day. The Future Queue is a great feature to use for this case. 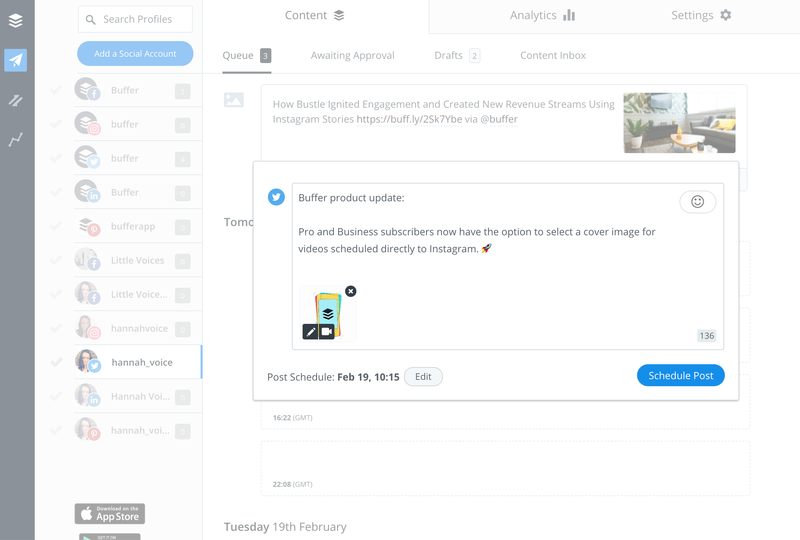 In your Queue, scroll past any scheduled posts and you’ll notice empty time slots from your Posting Schedule. You can click inside any of your empty time slots to schedule a post for that specific date and time, and thus, pin it in place. Create your post as usual and click Schedule Post. Posts created this way will be added to your Queue as "pinned posts", but will still be published as part of your usual posting flow, since the post will occupy one of your usual time slots from your Posting Schedule. You can spot "pinned posts" easily in your Queue as they'll be highlighted with a blue banner displaying the time they're due to be published. You can always change the time of a scheduled post by hovering over the time and clicking Change Time. Please note that this will then set a custom date and time for the post and it will then behave in the same way as if you'd used the Schedule Post option, as described above. Regular "Queue posts" can also be dragged into empty time slots within the Future Queue. This will convert them to "pinned posts".